ASPART-X™ IC-320 is the latest innovation from LINE-X® Protective Coatings. A ZERO VOC, aliphatic polyurea, ASPART-X provides superior U/V stability with excellent color and gloss retention. It is a versatile coatings solution with virtually limitless possibilities. From residential decks, patios, garage/basement floors – or commercial & industrial applications – ASPART-X provides unsurpassed performance. 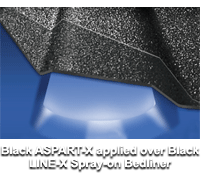 In Combination with other products in the LINE-X family, ASPART-X creates a tough, durable, U/V stable topcoat. No matter what your needs, your ASPART-X application will protect your investment for years to come.